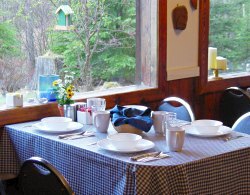 We have what you're looking for in relaxing and cozy accommodations... from one of our oldest but popular Trapper's Cabin, to our deluxe Log House, and everything in-between. We have 6 housekeeping cabins with kitchens, and heated with cozy woodstoves, and our cabins have everything you need for your stay. 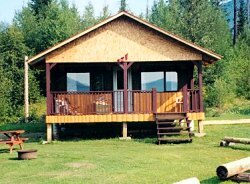 In addition to cabins, we have camping sites. RV sites are available (with hook-ups or with-out) centrally located on the lake-shore, and our campsites and tenting area is situated on a grassy area, close to the lakeshore. Each of our campsites has a fire-pit and picnic table. There's so much for you to do to here at Crooked Lake Resort, in the Cariboo. Not the least of which is fishing! Crooked Lake and the Horsefly area are famous for an abundance of wild rainbow trout, and we've had great luck fishing many of the nearby Cariboo lakes and rivers, rich with a variety of wild fish including Lake Trout, Kokanee and Rainbow Trout. This is some of the finest trout fishing anywhere. Take a hike and witness some of the most fantastic scenery you've ever seen. Whether hiking to the alpine meadows, or strolling down to Jason Falls, you'll have to stop and catch your breath from the stunning beauty of the British Columbia wilderness! We also invite you to bring the Mountain Bikes, ATVs' or Horses for a ride you won't soon forget. Here you'll find the best in British Columbia back-country recreation with plenty of logging roads to explore, or hit the rougher un-touched areas. Our Winter wonderland a great place for building snow-forts with the kids, sledding down the hill, or trying your hand at snow-shoeing. 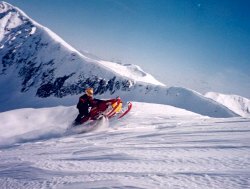 Bring your sled too, and trek up to the Eureka bowl for play time among the jumps. listen to the wolves howl - an eerie sound on a calm night. The alpine meadow of Eureka also has an abundance of beautiful BC scenery from mountains, to wildflowers, to waterscapes. We've expanded some of the bar options at the restaurant, and we've also added new Hot Specialty Coffee options. We serve excellent quality home-style cooking for our American Plan, and fresh baked goodies are always available!